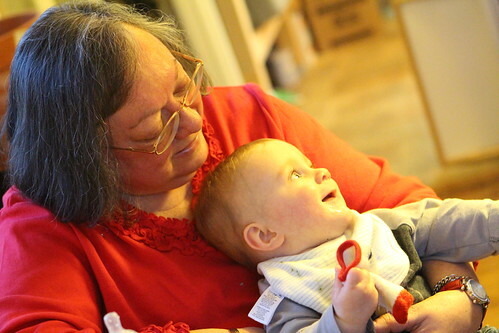 Tonight, after picking the Wombats up from daycare we had a visit from Nana and Grandpa who wer in town to spend the night and see the guys for the first time in almost three months. The guys had a little bit of a freak out at the break in routine. Normally, what is supposed to happen, is that I bring them home from daycare, play with them, and feed them all by myself while praying for Jen to return home from work. When they saw that I had two helpers this evening they weren't having any of it. There aren't supposed to be guests when they get home! Dad is supposed to do it all by himself! 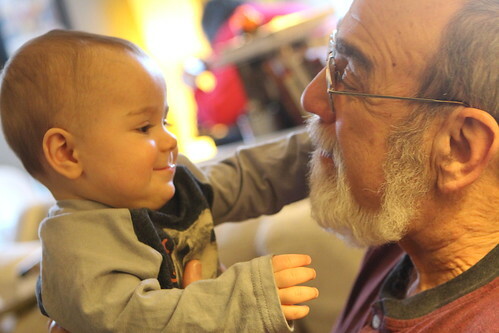 Elliott particularly enjoyed playing with Grandpa. However, like much of his affection, it may have been a clever ruse to try to steal someone's glasses. 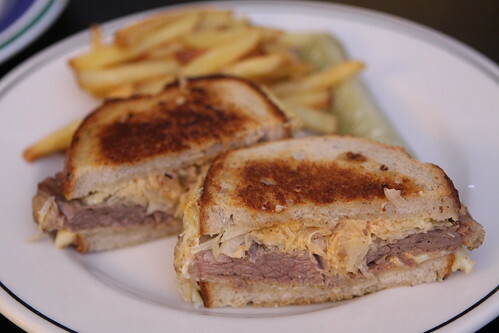 For dinner I made Reubens with the leftover St. Patrick's Day dinner, sauerkraut, Swiss cheese, fresh-baked rye bread, fries, and pickles. 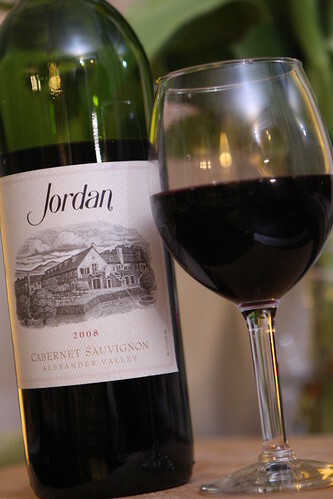 Nana STIM had this Jordan Winery Cabernet Sauvignon. I had what was to be the best of the Irish beers I purchased this year (by a long shot). 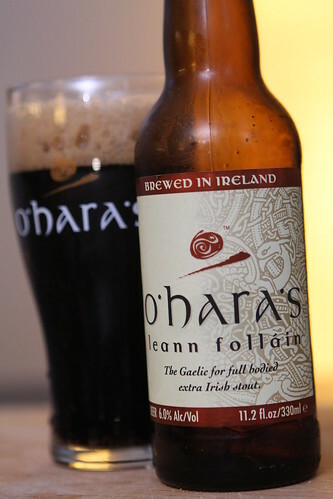 This was the O'Hara's Leann Folláin from Carlow Brewing Company. It was much better than the regular O'Hara's I had last year, probably due to the 6.0% ABV as opposed to 4.3%. It also had a pleasing carbonation, something lacking in the Guinness and Murphy's styles. A lot of people seem to really love Guinness and Murphys. Those that don't complain about beers like Guinness and Murphy's being too heavy and too bitter. I actually find them both to be exceptionally thin and mild but my main complaint is the very soft carbonation. I don't mind these for what they are but I would far prefer the Leann Folláin. It's the official beer of the Buythefarmshare.com St. Patrick's Day! Today was the Wombats' Grandad's birthday. 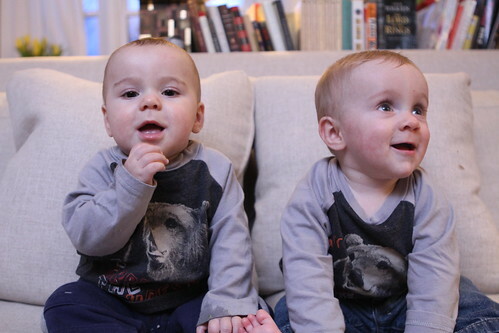 In honor of his special day they wore their bear t-shirts to celebrate his obsession with the woodland creature. 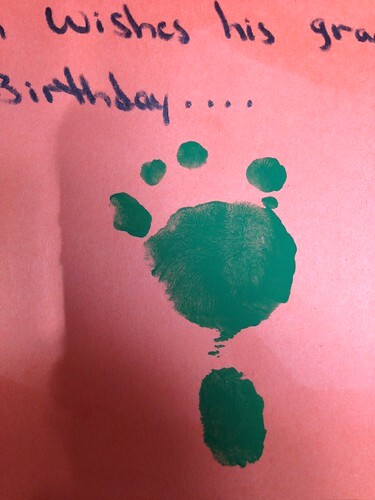 They even made a card for him at daycare. They are such thoughtful guys. We posed them with the card. This was a delicate proposition as we had mere seconds to act before they began tearing the card to shreds and trying to eat it. Things devolved quickly after that. 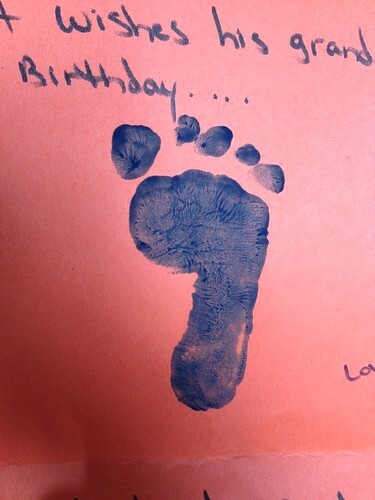 The card came complete with footprints from the guys. Elliott gave a nice footprint. 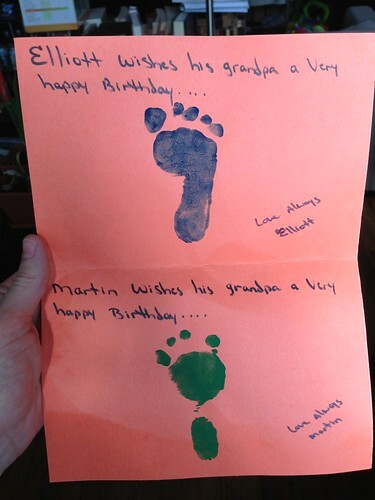 Martin could only spare four of his toes in honor of Granddad's birthday. Apparently he's holding a grudge about something. Good luck getting in the will now, Martin.